A man who thinks he is an alien finds himself in a mental institution. He has been visited by many doctors, but none of them were able to help him. The hospital has brought in a specialist to try to get some answers. This specialist is the top of his field and he may be able to unlock the secrets of the patient and be able to answer: Is he an alien, or simply a man seeking attention. 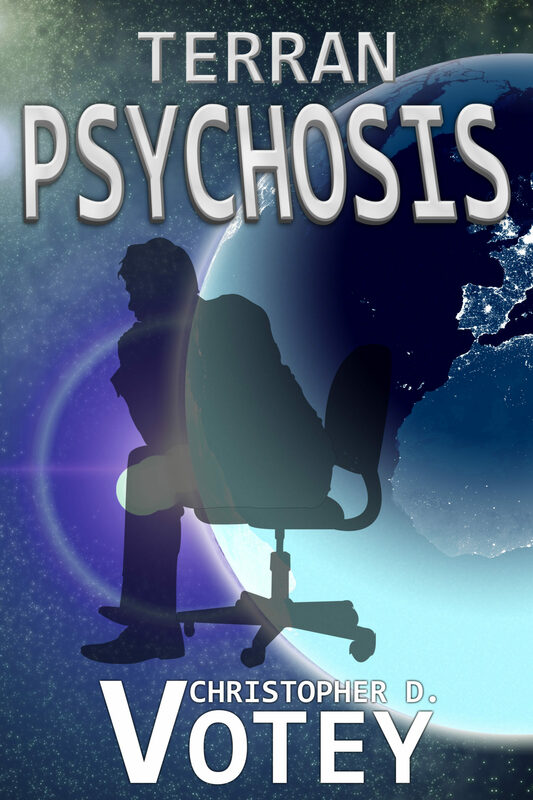 Terran Psychosis is a clever novella about Gordon Johnson, a Wall Street stockbroker that claims to be an alien from another planet. After he announces this fact to the world, he is buckled into a straight-jacket and taken to a mental institution where he meets a doctor intent on curing him. As a short book, saying anything more would simply be spoilers. But even though it’s not a long read, the story takes you off in different directions, and just when you think you know where it’s going, it twists again. Things get flipped right on their head if you’ll pardon the pun. I was surprised in fact just how much story got packed in to eight chapters. There’s some sharp dialogue, and some inventive and imaginative characters. And even though I thought Chris Votey might pull out one more twist at the end, the story is well-rounded and has a satisfying finish. It’s a good quirky twisty read. Ideal for filling your lunch hour on a slow day. I received a free copy for an honest non-reciprocal review. So as not to give anything way, I will suffice it to say the characters for this story are very interesting, putting it mildly. The plot is an incredibly intriguing one, and it certainly picks up after a few revealing details. I will definitely put this author on my list to keep on eye on for the future. I wrote this book right after I wrote Scraping By, initially as another short story. I tried to keep this short, originally being 6 pages long (which is now the second chapter). Upon reaching the end, I had written one line too many. My editor at the time told me that I could either take that out, or continue on with the story. I do have plans to continue the story from here, with quite a few twists and turns to come. It’s not that I’m trying to twist the reader, but that is just how the story must be told. I’m an alien. Hard to swallow, I can imagine. You probably think I belong in a mental institution. Funny part is… I already am. Despite being in a mental institution, I can tell you; it is true. I am a being from another world. Hell, another galaxy if we’re keeping score here. I came here to study you. Not you specifically, but all of you. Why are we studying you? To study is to understand. We want to understand you. All the advanced technology we have and yet we still have to talk to you to get inside your head. We have been to your planet many, many times; watching and waiting. Occasionally you’ve seen us, but only what we wanted you to see. In years past, you saw us a lot more because all we had was television to understand you. Thanks to the Internet and Social Networking websites, we don’t need you to see us for us to know what you’re thinking. However, nothing quite replaces face-to-face interaction. Truthfully, I’d rather be somewhere else. Most of you are okay, but actual field work is not my cup of tea. I took this job as a way to build some connections and network a little to get a cushier job. But a saying on your planet applies to my situation… always read the fine print. As I mentioned, we seek to understand you. What do you think about? What makes you tick? More specifically, what will you think of us? It is a concern of ours that you can’t handle us. Some believe you won’t ever be able to; you’re too violent. Others are the opposite and think you’ll need more time. One thing that can be decided is that, at present, you are not ready for us. But enough about your race… let’s talk about me. That is why I am here after all. My job was simple… tell people the truth. My story starts with me arriving to Earth as a human. My appearance was altered to resemble humans, a far cry from what I actually look like. It’s hard to describe the difference without a good frame of reference… but I can say we are not as smooth. So I came here, and was able to set myself up with a job and a place to live. Up until a few weeks ago, I was a successful businessman on Wall Street. I was the envy of many. Men wanted to be me and women wanted to do me. This was the life that all humans strive to have. That was the first stage of my operation, to become wealthy and popular. I could have killed someone, and not only gotten away with it, but still be loved by many. Stage two involved revealing the truth. Now I could’ve gone on TV to reveal myself, but these days TV and movies are good at convincing people anything is real. So my antics on public media could’ve been explained away; same with the Internet.